Pongal is the harvest festival of Tamil Nadu celebrated for four days from January 13 -16. The first day is called the Bhogi Pongal, second day is the Pongal/Thai Pongal, third day is the Mattu Pongal and the fourth day is the Kaanum Pongal/Kanni Pongal. 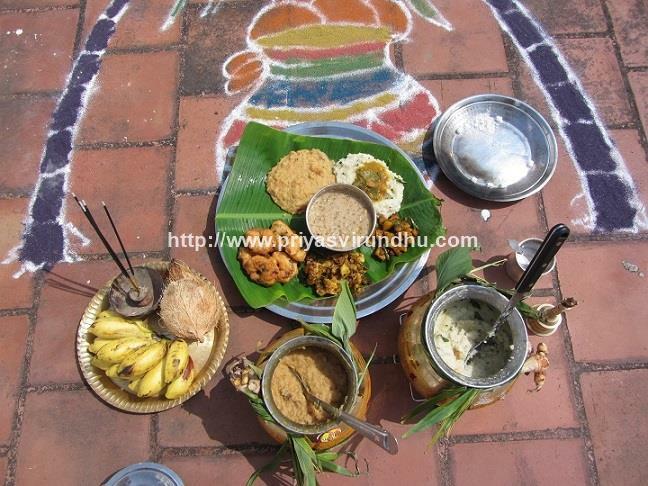 Pongal is celebrated with great zest through out Tamil Nadu, a traditional occasion on which special thanks is offered to nature, Sun god, Rain god[Indra], Cow etc. Let’s burn all the useless superstitious thoughts in our mind and try to be more sensible. Let’s burn all our enmity, vengeance, fear and try to love people more. Let’s burn all our bad thoughts and become a new loving and a kind person. Next to Bhogi Pongal is the Pongal/Thai Pongal is the special day marks the beginning of the new auspicious month in Tamil Calendar. 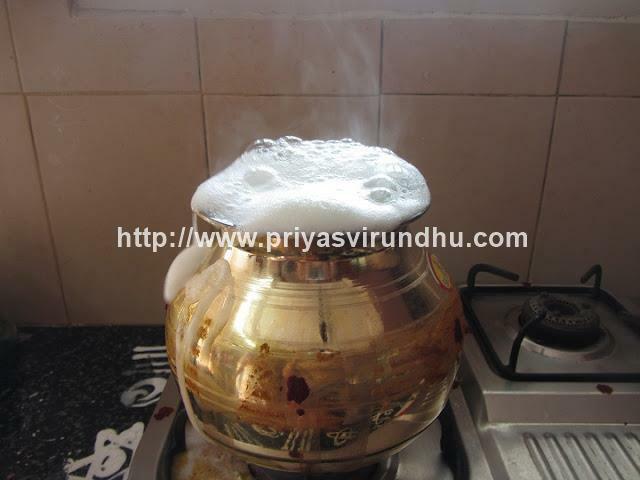 Sweet Pongal/Chakkara Pongal is made in either bronze[venkalam] pots or mud pots with the freshly harvested rice, jaggery, milk and offered to Sun god along with sugarcanes, yellow pumpkin, white pumpkin, coconut, bananas etc. 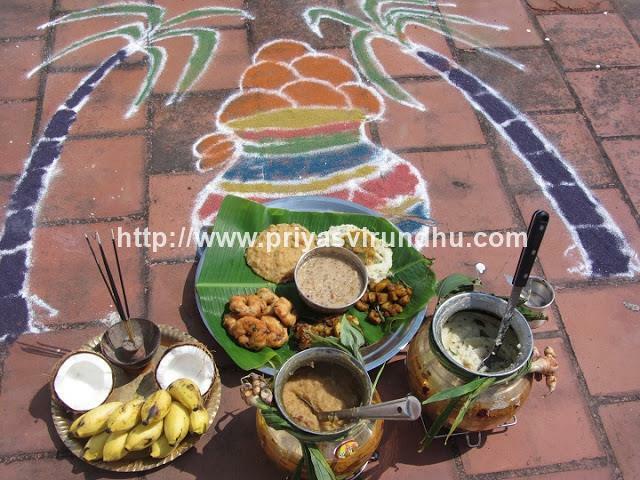 The pongal pot is tied with turmeric plants and ginger plants The house is decorated with mango leaves and thoranams, big colorful kolams are drawn in front of all the houses. 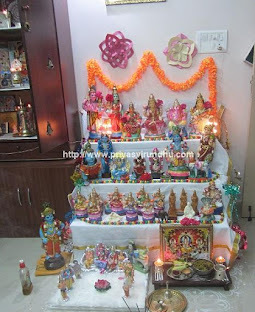 All the people wear traditional dress like saree, dhothi, pattu pavadai, half sarees etc and special poojas and prayers are performed. 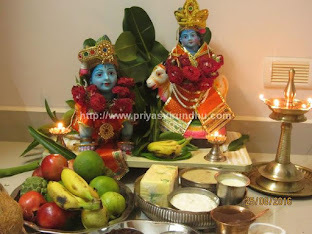 After Pongal it is the Mattu Pongal - is the celebration of the cattle, particularly cows and bulls which play a very important role by working very hard to help the farmers to raise the crops. Cows and bulls have always played a vital role in each and every human beings life either directly or indirectly. Cows gives nourishing milk while bulls and oxen help plough the field. So this special day is when the cows are given special honors and prayers. The cows and bulls are washed, horns are painted, multi colored beads, tinkling bells, flower garlands are tied around the neck. The cows are then fed with pongal and taken all around the village, people offer special aarthis for the cow, give them pongal and people get the blessing from the cow by touching their feet and forehead. Jallikattu - Bull Festival is held in Madurai, Tiruchirapalli and Tanjavur on this day. Bag of money is tied to the horns of ferocious bulls whic the villages try to retrieve. Every young lad in the village tries to participate in this game to show their bravery and also for fun. The next day to Mattu Pongal is the Kannum Pongal/Kanni Pongal - is the day when the families reunite, visit all the relatives and friends. On this day, brothers pay special tribute to their married sisters by giving gifts as a token of love. Not only brothers, everyone shares gifts amongst each other to show their love and affection. Kannum means to view so now a days people are flocking to beaches, theme parks, gardens, malls etc to spend time with their families. 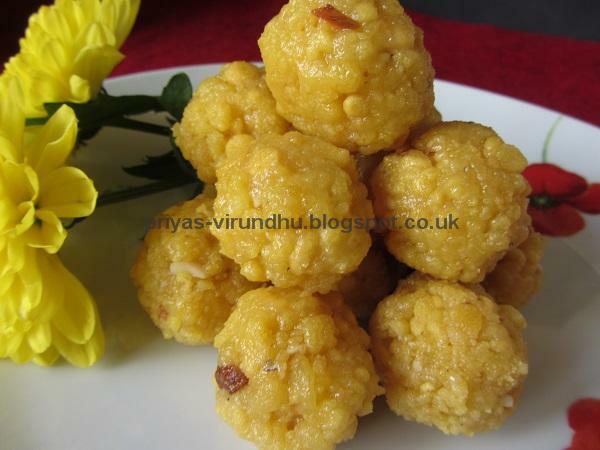 It is otherwise also called as Kanni Pongal, because unmarried girls[Kanni] in villages takes pots of delicious food to the river banks, play games the whole day and enjoy the food with great enthusiasm. White rice, appalam, yogurt/thayir and mango pickle. I hope you all enjoyed reading the article, information collected from various sources including wikipedia. 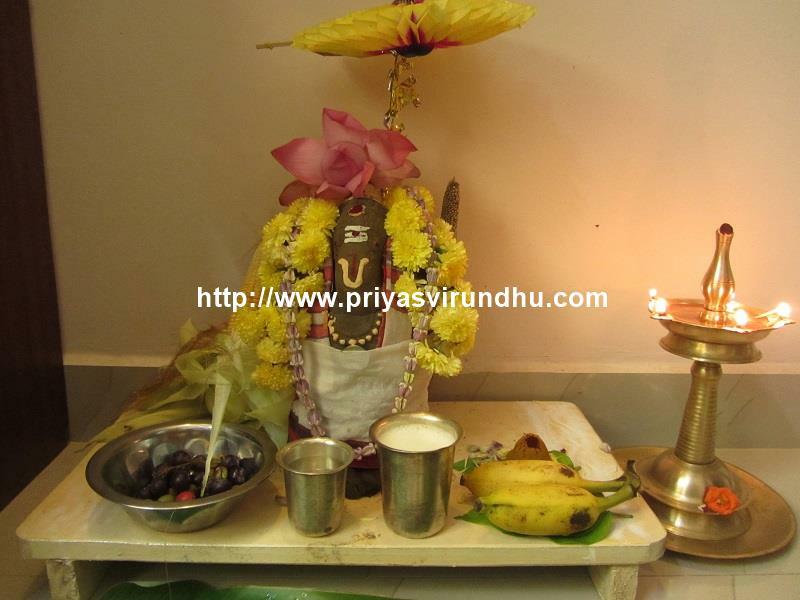 Once again wishing you all a very Happy Pongal/Uzhavar Thirunaal Vaazthukkal. Thank you for visiting my blog, please come back again for more and more delicious, authentic and traditional recipes of Tamil Nadu.